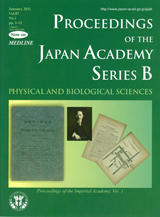 The Proceedings of the Japan Academy, then the Proceedings of the Imperial Academy, has been published for 100 years. The publication started in 1912. The first issue contained articles describing the outline of the Imperial Academy instead of scientific ones. The first scientific paper appeared in issue No. 2 of volume 1 of the Proceedings in 1913. The paper entitled “The Ellipsograph of Hazama Gorobei Shigetomi” was written by Dairoku Kikuchi (see photo), the President of the Imperial Academy at that time. Kikuchi was an eminent mathematician and realized that the Japanese Mathematics developed in the Edo period (1600-1868) was quite unique and its level was as high as that of those in Western countries. Kikuchi was eager to introduce the excellent works of the Japanese Mathematics and, as one of those, described the invention of the Ellipsograph by Hazana Gorobei Shigetomi who was well-known in his research on astronomical observation. The publication of the Proceedings was irregularly at the beginning. Since volume 2 of the Proceedings in 1926, the publication has been ten issues of each volume per year, separately for Mathematics (Series A) and Natural Sciences (Series B).